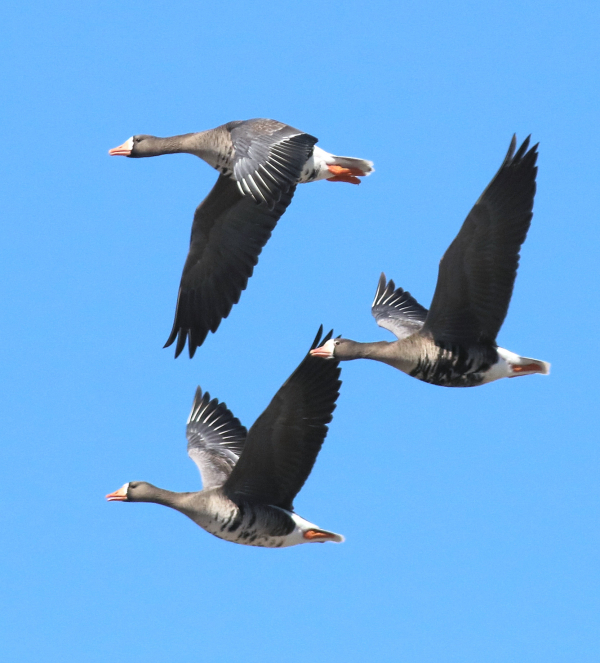 White-fronted Geese are among the five species of geese in the area. 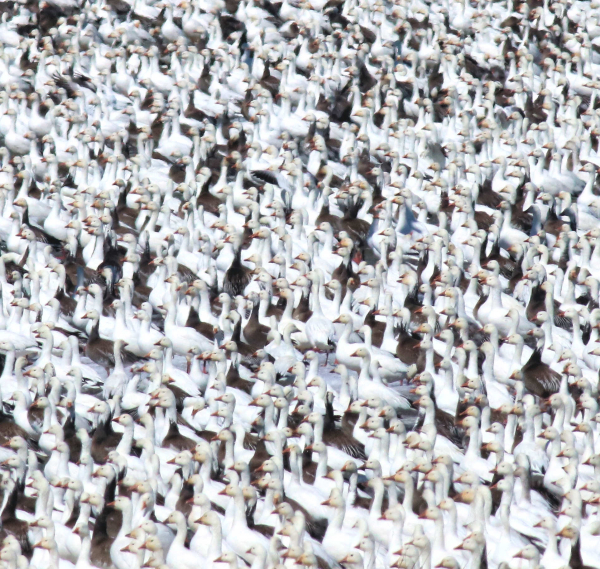 A small portion of an expansive flock of Snow Geese, including a number of Ross’s Geese mixed in, along with a high proportion of blue morph Snows. 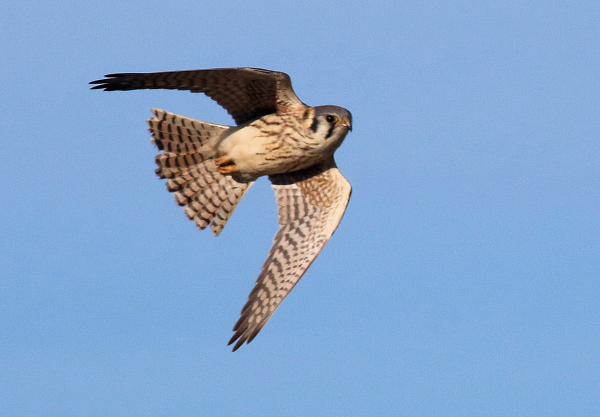 Falcon in flight; a female American Kestrel slices through the spring wind. During recent weeks, most of the excitement seems to happen on Fridays, so I shouldn’t have been surprised that last Friday was an all-day migration event south of my office in south-central North Dakota. Throughout the day a continuous migration of flocks of geese kept me occupied – five species – Cackling, White-fronted, Canada, Ross’s, and Snow Geese plied the sky; sometimes in species-specific flocks, often in mixed-species flocks. If I stayed in one location, the flocks came to me; if I drove around the area to see what else I could find, the flocks were coursing the sky above and beyond me all the way. Another highlight was finding a Red-tailed Hawk mantling prey on the ice of a big lake with a considerable trail of wind-blown white feathers behind it. As I stopped to take a closer look I was surprised by the loud, close call of another Red-tail – much closer – as it took flight in front of me. The hawk with prey stood its ground, or its ice in this case, and judging by the white feathers, I figured it had grabbed a Ring-billed Gull (I also verified the prey species). It’s interesting to note that the only other time I’ve seen a hawk with a gull as prey was at this same location, where a Red-tail flew off with the remains of a Ring-billed Gull about a year ago. In retrospect, I didn’t need to go very far afield to find interesting birds Friday afternoon. There were three species of geese in a shallow wetland just ½ mile south of my office – about 30 Cackling Geese, 4 White-fronts, and 8 Giant Canadas – with much larger flocks of Snow and Ross’s Geese migrating northbound overhead periodically. The geese flushed, then circled back when a Bald Eagle flew low over the wetland I call Melody Marsh (Melody owns the marsh and surrounding native grassland). Add to that scene, more Mallards, periodic soaring Red-tails, and coursing male Northern Harriers – all with the background songs of Western Meadowlarks and Red-winged Blackbirds – nice live nature feed I thought. Sunday was a thrill a minute! After a foggy Saturday when you couldn’t see more than about 50 feet in any direction, I drove south Sunday morning to see small flocks of Cackling Geese rising from Melody Marsh. As I came over a low rise I was thrilled to see the marsh blanketed by geese – more than 1,000 Snow Geese with plenty of Ross’s Geese mixed in, plus Cackling and White-fronted Geese feeding in the shallows closest to the road. I parked so I could photograph the mixed flocks of Cacklers and White-fronts taking flight toward me with the sun behind me. Many Snows and Ross’s began swimming in my direction, eventually filling into the area being evacuated by the other two species to feed on something below water level. I stayed in position about an hour, then resumed my drive southbound. I only managed to get three more miles down the road before tens of thousands of Snow Geese stopped my progress. While observing and photographing this mega-flock, I could see a like-numbered cloud of geese rise up periodically a few miles to the east. Were these flocks spread throughout the area? They had been along my short drive so far. But it turned out that these were all the geese within a 15 mile radius – and probably farther. So how can you beat that – an amazing concentration of geese that ebbed and flowed from location to location within a couple miles of home. While enjoying the geese, there was a continuing northbound migration of scattered raptors, mostly American Kestrels, Northern Harriers, and Red-tailed Hawks; but I also sighted 3 lone Rough-legged Hawks and 4 Bald Eagles (2 immatures together and 2 lone adults). There were also several first sightings of the spring to enjoy – a couple widespread Franklin’s Gulls, Buffleheads, Gadwalls, Northern Shovelers, a Cooper’s Hawk, a Great Blue Heron, Double-crested Cormorants, and the biggest surprise of the early spring – White Pelicans – including a flock of about 20 that were catching fish on the edge of the ice of a big lake just 2 miles south. One pelican even hoisted itself onto the ice to stand like an “Arctic pelican.” Have you ever heard of such a crazy sighting? Obviously, it was an amazing weekend for spring migration in Paul’s neighborhood (at least during Friday and Sunday)! I can’t wait to see what transpires next, and I hope your coming week gives you some thills to share too.